Common Problem: Error Message, No Display, CD won't play or Skips. Repair Cost: $385. to $550. Navigation disc is inside but gives the message "insert disc" or does not play music CD, does not accept nor eject disc. 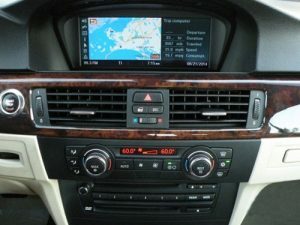 No Display or intermittent display, BMW Logo shows on screen but no sound and no functions, Intermittent functions. 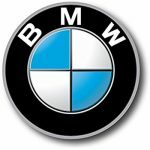 Note: If you have your unit repaired or replaced and after installation there is no sound then you need to have it programmed by an Authorized BMW Dealer. 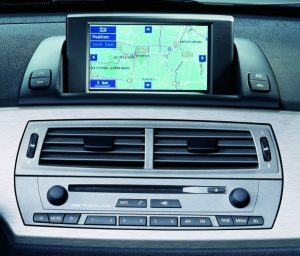 If there is sound but your blue tooth or satellite tuner is not working "if your car is equipped with blue tooth or satellite Tuner" then you also need to have it programmed by an Authorized BMW Dealer. Common Problem: No Display, CD won't play or Skips. Repair Cost: $125. to $250. Note: Might require programming after repair or exchange. Common Problem: Keeps rebooting, Shows Logo only, Intermittent black display, Does not accept disc, GPS does not work. Repair Cost: $300. to $550. Common Problem: Does not open automatically or Dark Screen. Repair Cost: $300. to $650. Common Problem: DVD player shows error, Plays CD but not DVD, Does not accept disc. Repair Cost: $350. to $550. Repair Cost: $150. to $385. Common Problem: Keeps rebooting, No Sound and No display, DVD player shows error, Plays CD but not DVD, Does not accept disc. Repair Cost: $320. to $550. Repair Cost: $200. to $750. Common Problem: Woofers have no sound, Static or popping noise, Door speakers cut in & out or no sound or distorted. Repair Cost: $300. to $475. Note: This Amplifiers powers up only your Rear Doors (Driver and Passenger side), sub Woofers on the floor, under Driver Seat and Passenger Seat and Center Speaker on dash board. 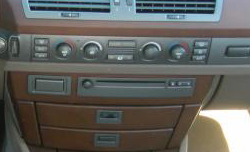 The Front Door speakers, and Rear Deck speakers (behind rear seat) are powered up by the in dash single CD player "ASK unit". Common Problem: Does not eject disc, Does not show map on the screen, Stays on drain causing the battery to drain. 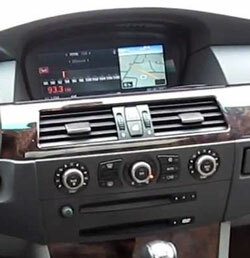 This instructional video shows you how to diagnose your BMW 7 series sound system and navigation system. If there is no sound or sound is distorted, CD and CDC is grayed out on the screen, AM / FM stations not shown on the display any more, map does not show on the display or audio goes out intermittently, you should watch this video instead of guessing which component is bad. 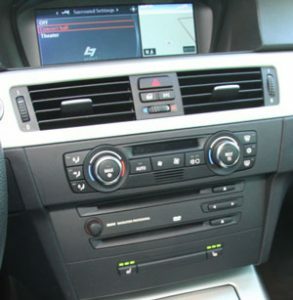 Common Problem: Loose Volume Control, Static in front or rear deck speakers., No sound, CD won't eject, Won't read disc. Note: The ASK unit powers up front door speakers plus rear deck speakers behind the rear seat and can't be bypassed. Common Problem: If you have Blank screen with or without lines and audio cuts out after 3 minutes, then your navigation unit in your trunk is defective. This part is not just a GPS unit, it also drives your display in the car. Other problems are: Does not read disc, Does not accept nor eject Disc, does not show correct map, Freeze up after disclaimer. Flat Rate Repair Cost: $300. to $425. Note: Extra Repair cost if complete PC Board needs to be replaced. 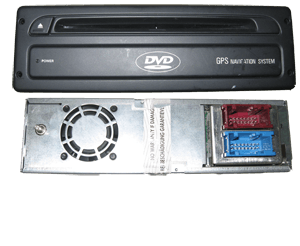 The MKIV is DVD-based, fast and can use both CD and DVD navigation disks The MK III system can be upgraded to a MK IV, it is a simple plug and play swap. (SEE SPECIFICATIONS ON THE BOTTOM OF THIS PAGE). Common Problem: If you have blank screen with or without lines and audio cuts out after 3 minutes, then your navigation unit in your trunk is defective. This part is not just a GPS unit, it also drives your display in the car. Other problems are: Does not accept nor eject Disc, Does not show correct map. Note: Extra repair cost if complete PC Board needs to be replaced. Flat Rate Repair Cost: $395. Common Problem: Black screen, Horizontal Lines, Won't accept Tape or CD, Loose Volume Control, Won't open, intermittently display goes out. Flat Rate Repair Cost: $200. to $485. Flat Rate Repair Cost: $185. Flat Rate Repair Cost: $175. These units are held in the trunk by two screws that can be easily seen above the player. Once unscrewed, the changer will slide forward off the mounting Brackets and it has a connector on the black wire about 10 inches from the unit that you can unplug and another wire that unplugs. When changer is mounted in vertical position, on the left side of trunk. If you can’t get to the screws that hold the changer to the mounting bracket, it is best to unbolt the 3 bolts on the changers metal bracket from the body of the trunk and bring out the changer and the bracket all at once. 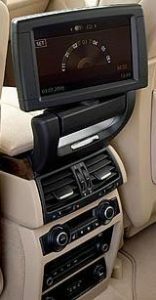 5 & 7 Series stereo and tape deck - The volume control pulls off to expose an allen head screw that when turned, releases the displays left edge and it swings out. That should expose additional allen head screws to remove upper portion. 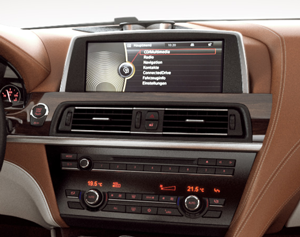 Use a small screwdriver and open the small doors that are on the left and right side of the stereo. Inside is an allen head screw. Turn the screw counter clockwise until it releases the stereo then just pull it out. These screws do not come out, just loosen it. Then there is a block on the back with wires going to the stereo. The block has a slide piece ontop that you can pry up with a regular flat screwdriver (there is also a picture of a screwdriver on the plastic) This tells you to pry it up, once it goes up about 1 inch the block of wires will pull off the stereo. There are couple other small cables that pry off easily. 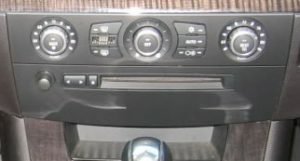 First step is to remove the navigation unit located in the trunk by using special BMW U shaped tools or simply just use 4 "4 inch long nails" inserting into 4 holes as shown in the pictures then slide out the navigation computer. 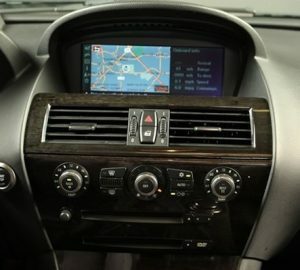 If you are upgrading from an MKII Navigation computer, reach in the access door to the left of the CD Changer and gently pull up on the antenna cable connector attached to the GPS module as shown in the photo below. Remove this cable, route it thru the back of the Navigation computer frame and connect to the back of your model navigation computer. You can disconnect the power connector to the separate GPS module as it will no longer be needed. 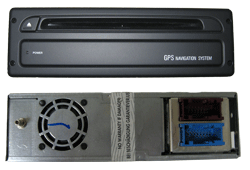 The MK3, MK4 computers has a GPS module built in. Intallation of the new navigation is just reverse. Upgrade from the MK2 and MK3 Navigation Computers! 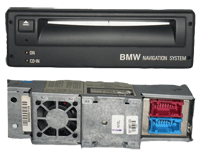 These systems were first seen in the E39 in August 2000 production and E38s for the 2001 model year. The MKIII system simplified the layout a bit further (see Diagram 3 at the end of this document), moving the GPS receiver (Trimble) inside the nav computer housing; now GPS antenna is plugged directly into the MKIII computer itself. Software upgrades included more choices of native languages, and a split-screen option for the graphics to take advantage of the wide screen On Board Monitor launched in mid production of the 2001 model year. A faster CPU of course was also another key advancement. 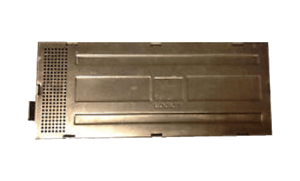 These systems were first seen in the E39 in August 2000 production andE38s for the 2001 model year. GPS receiver (Trimble ) is located inside the nav computer housing; now GPS antenna is plugged directly into theMKIII computer itself. 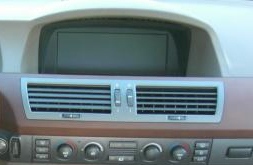 Software upgrades included more choices of nativelanguages, and a split-screen option for the graphics to take advantage of the widescreen On Board Monitor launched in mid production of the 2001 model year. Afaster CPU of course was also another key advancement.